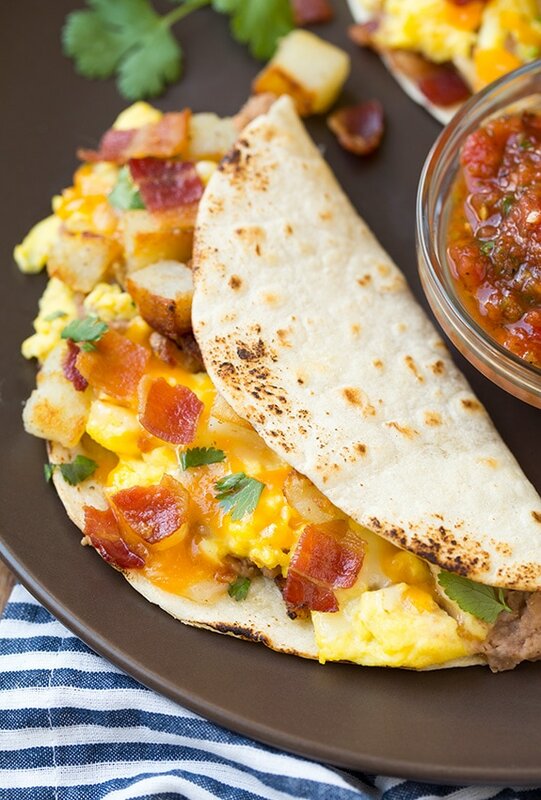 If there is one thing I know how to make it’s a seriously delicious breakfast taco. Some of you may be laughing and saying, really? There isn’t even chorizo on these tacos, but I say why use chorizo when you can use bacon? I was first introduced to the best breakfast tacos when I was in Mexico traveling with a humanitarian group and we had these sweetest ladies making us breakfast every morning – and it was all from scratch. I’ve been hooked ever since but I hardly ever have time to make my tortillas from scratch, if only I could figure out how to roll and shape them as fast as those ladies did! 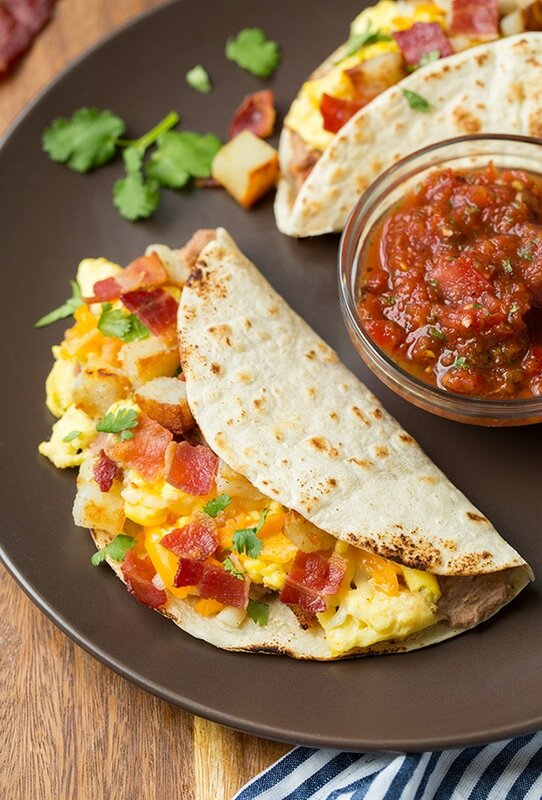 Breakfast tacos really are very versatile and you can most definitely use this recipe for breakfast burritos, simply buy or make the burrito size tortillas, you just won’t get quite as many. 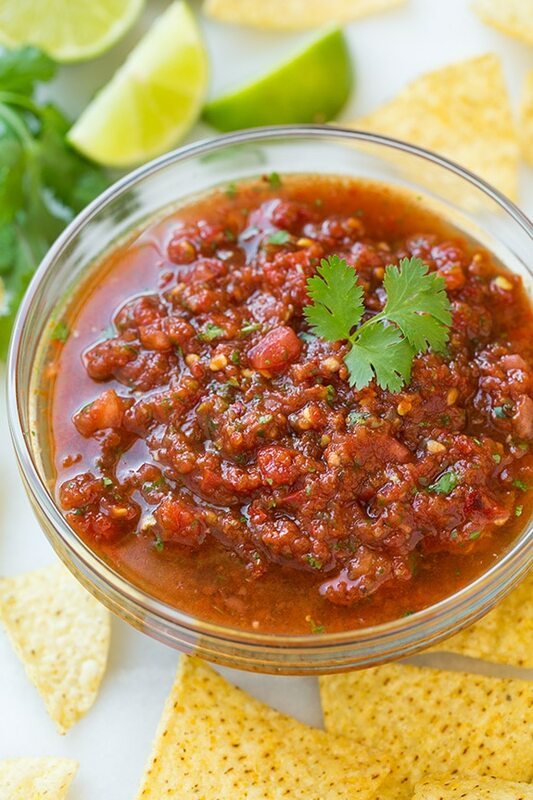 If you insist, you can use chorizo instead of bacon and you can use any salsa or hot sauce you’d like, I’m just loving this salsa lately. I know the way I make potatoes is probably strange but it’s the way I’ve been doing it for like 10 years. I like to do it this way because not only does it give me perfect breakfast potatoes by partially baking them in the oven and finishing them off in a hot skillet, but it’s so convenient when I’m making baked potatoes for dinner the night before (or even a few days), I’ll throw in some extra potatoes and just set the time for the 38 minutes take the ones out all be using for breakfast potatoes and let the others continue to bake for dinner. 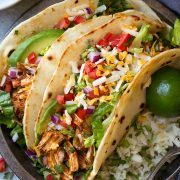 These tacos are incredibly delicious, total comfort food! They are completely hearty and filling and these aren’t just for breakfast, this is a dinner that would make anyone happy. 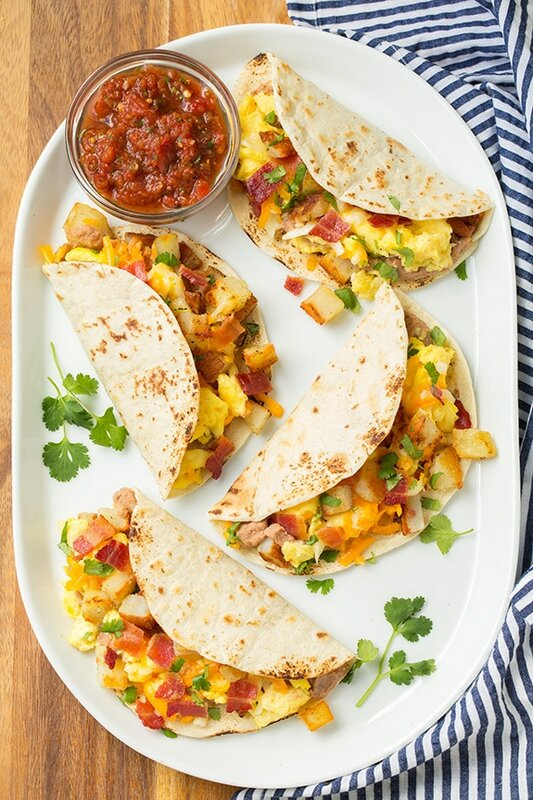 These breakfast tacos are perfect for a weekend breakfast! 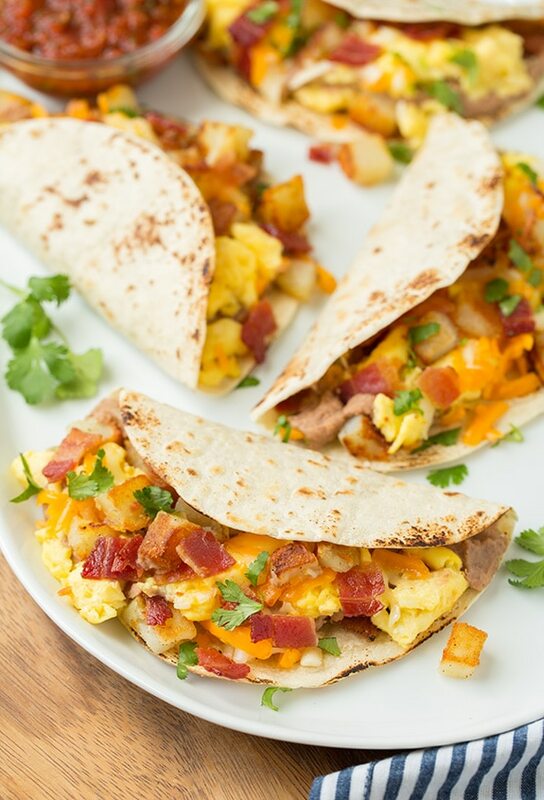 Tortillas are layered with fried potatoes, creamy refried beans, scrambled eggs, crisp bacon, flavorful cheese and a fire roasted salsa - so much goodness in one taco! 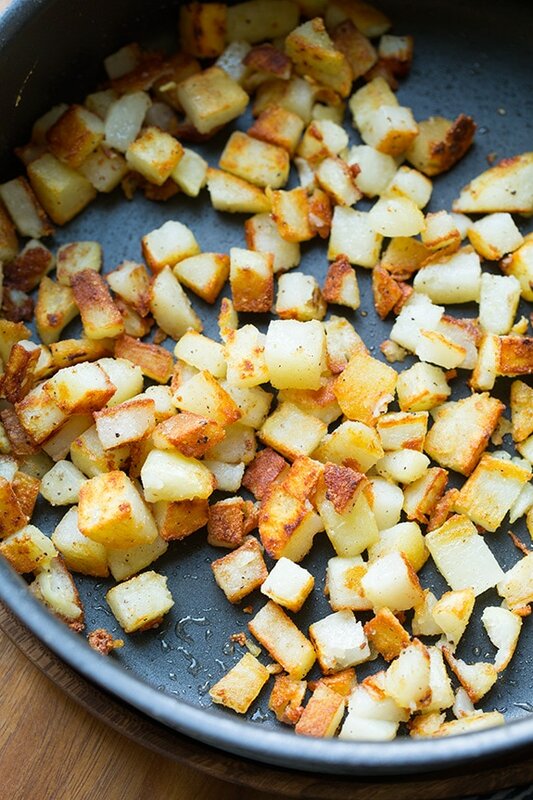 Scrub and rinse potatoes and pierce each with a fork two times. 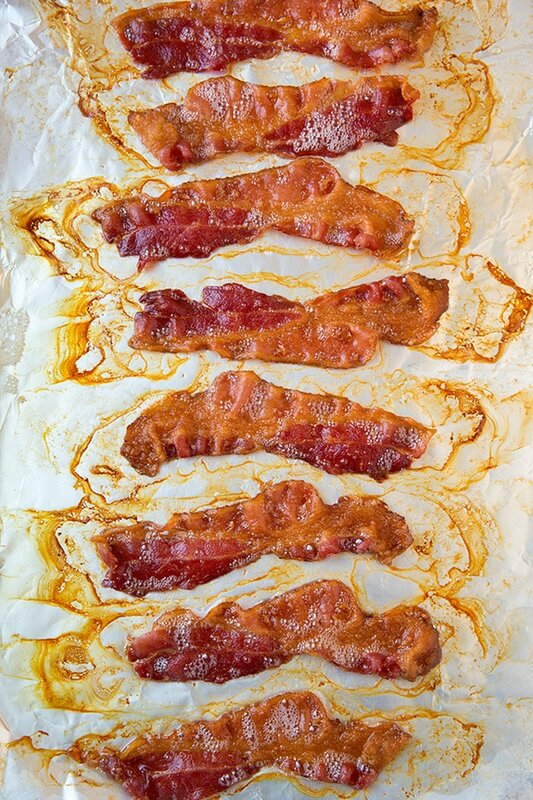 Place in oven and heat to 400 degrees (it doesn't need to be preheated) and bake 38 minutes. Remove and cool slightly then cool completely in refrigerator (I like to do this the night before and chill them overnight. If you cut them hot they crumble). Peel cooled potatoes if desired, then cut into 1/2-inch cubes. *For a shortcut here you can just use the frozen diced potatoes (regular or O'brien) and cook in bacon drippings according to directions listed on package. 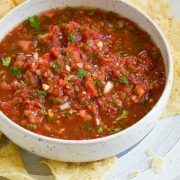 **If using canned refried beans, I recommend mixing a little water into them as they always seem to be super thick. For the homemade version see this recipe here just start with a low amount of water about 1/2 cup when blending then add more as needed and omit the cheese in that recipe. I used that recipe for these tacos. Nancy K: Jaclyn do you have the recipe for homemade refried beans? When I click on the homemade (here) in this recipe it sends me to a website -W- that asks for an email and password. Jeannette Shields: Today is February 6, 2016, so I don’t know if you will see this or not,but I hope so!